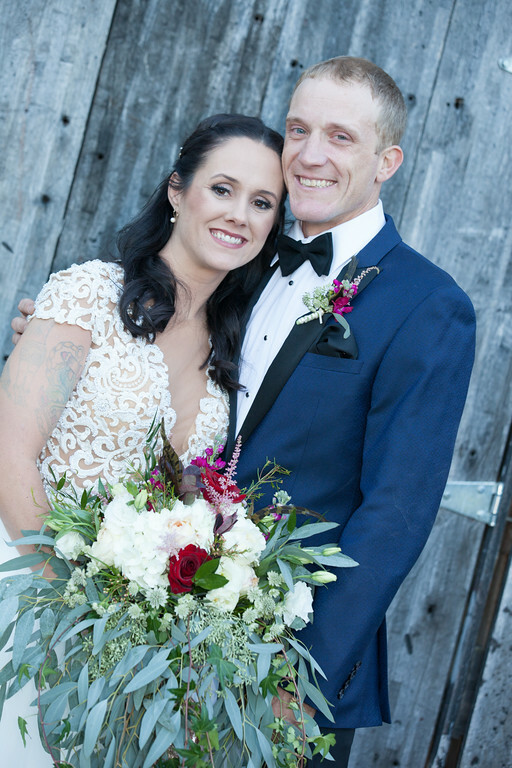 Brooke and Jeffrey were married at The Barn at Twin Oaks Ranch on October 28, 2017. Their color palette was a beautiful, romantic combination of burgundy, blush, shades of white, and greenery. "I love flowers and being outside, so I wanted a ton of flowers all over," Brooke said. They had gorgeous flowers everywhere, as well as several glitzy details! This wedding was glam, feminine and romantic! 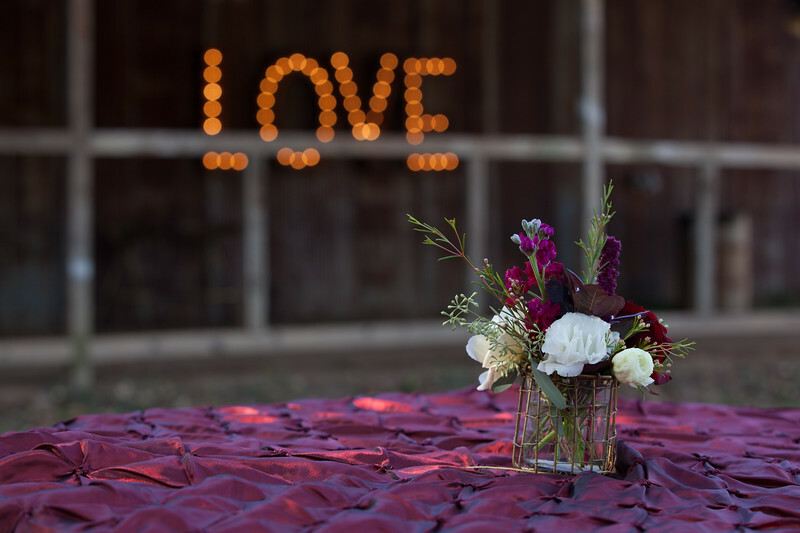 Enjoy their sweet photos by Shawna Long Photography! We LOVE wedding videography, and we encourage our couples to hire a videographer if they can possibly work it into their budget. 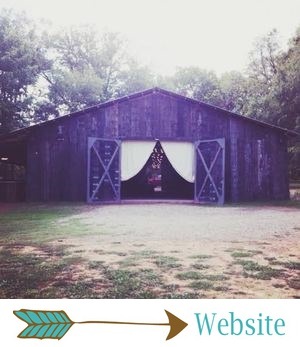 This video by Arkansassy Productions includes all of the moments Brooke and Jeffrey will always want to remember, as well as sweet messages from their guests and shots of all their pretty details. Two of the highlights from this wedding were Brooke's fabulous bridal gown and her stunning bouquet! Brooke found her dress at Inverness Bridal Couture, and it was AMAZING. We absolutely loved the full skirt, the subtle bling at the waist, the illusion neckline and the cut-out back. I also loved her gorgeous hairpiece! 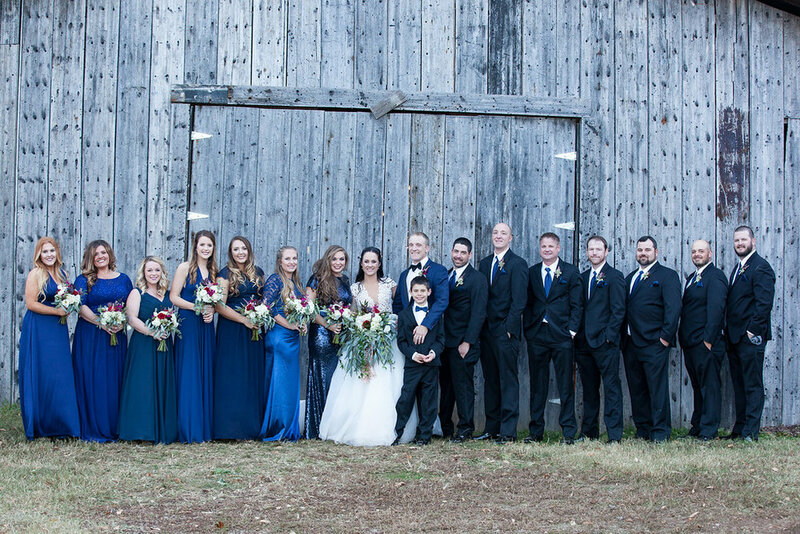 Brooke's bridesmaids wore navy, floor-length dresses in different styles. She let them pick their dress, shoes, makeup, hairstyle, and accessories. What a laidback bride! These girls couldn't have looked more gorgeous, and their dresses went together flawlessly! The guys were also super fashionable and handsome, and I'm really into Jeffrey's navy jacket and bow tie! When a bride requests tons of flowers everywhere, we obviously have to go all out with her bouquets and florals! Brooke's bridal bouquet was EPIC, and she said it was her favorite detail! It was enormous, with burgundy roses, white and blush flowers, and loads of greenery. 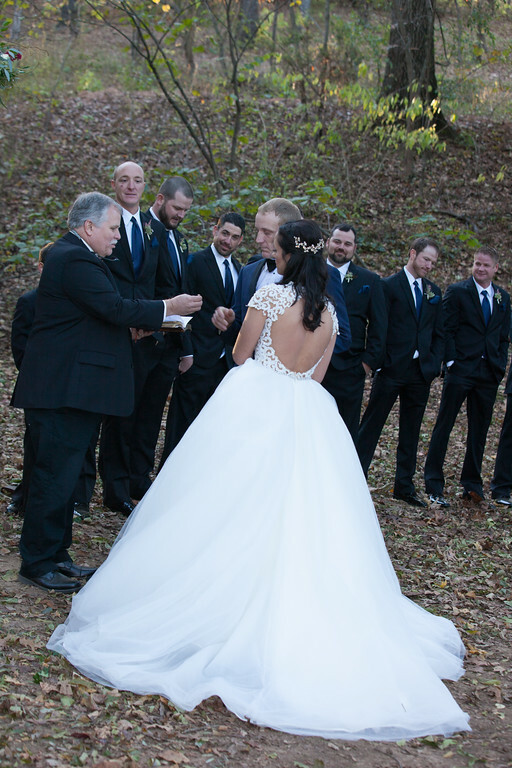 "The greenery in my bouquet was the prettiest I have ever seen," Brooke said. 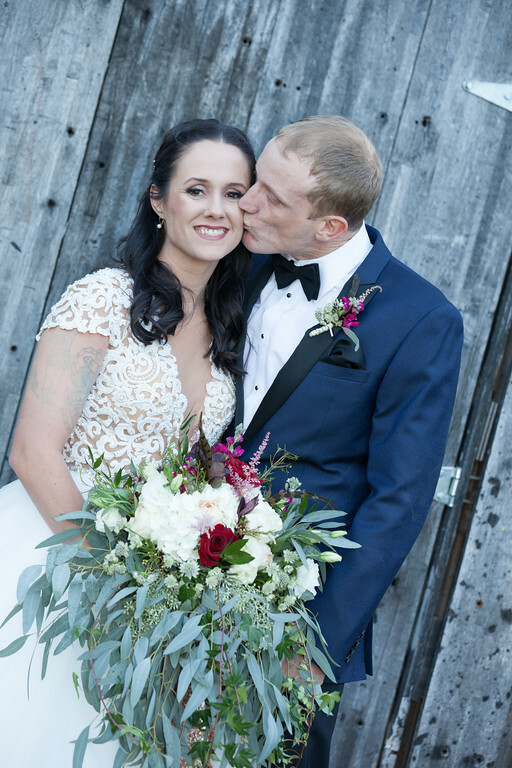 "I was in love with my bouquet and felt it perfectly matched my personality and my gown! 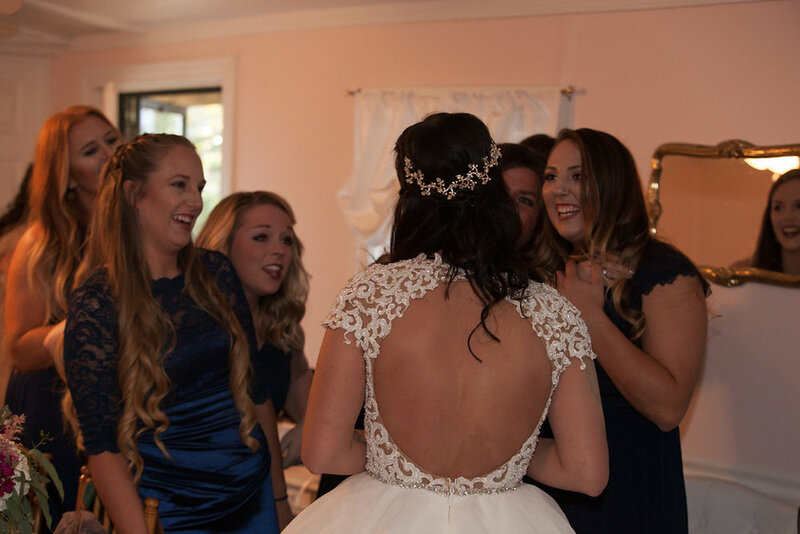 My bridal party had mini versions of my bouquet so of course I loved them as well!" Their flower girl's little flower crown was the CUTEST floral detail! 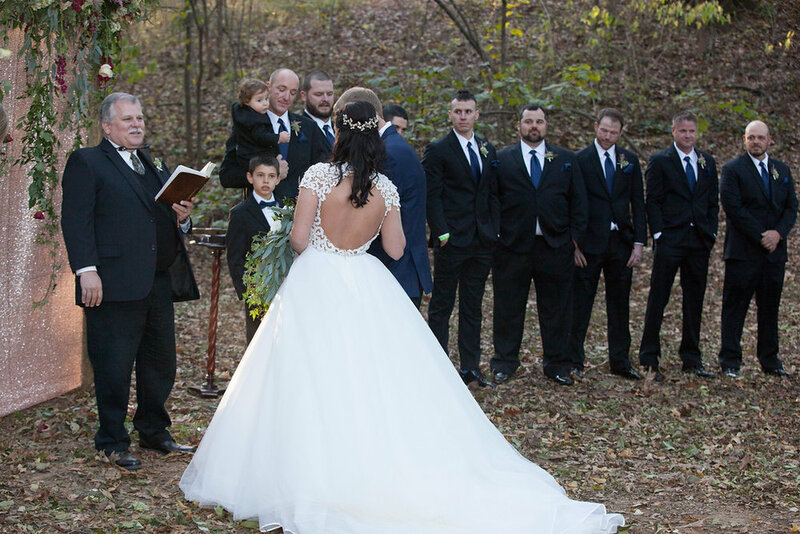 Brooke and Jeffrey’s ceremony details were glam, full of flowers, dramatic and GORGEOUS. Their altar was stunning, with a sequined backdrop, the prettiest greenery, and white and burgundy flowers. We loved the signs lining their aisle that had verses from 1 Corinthians 13 painted on them in a beautiful calligraphy! Their ceremony was extra special, because they included their two little boys in every moment, including their unity ceremony. This family is precious! 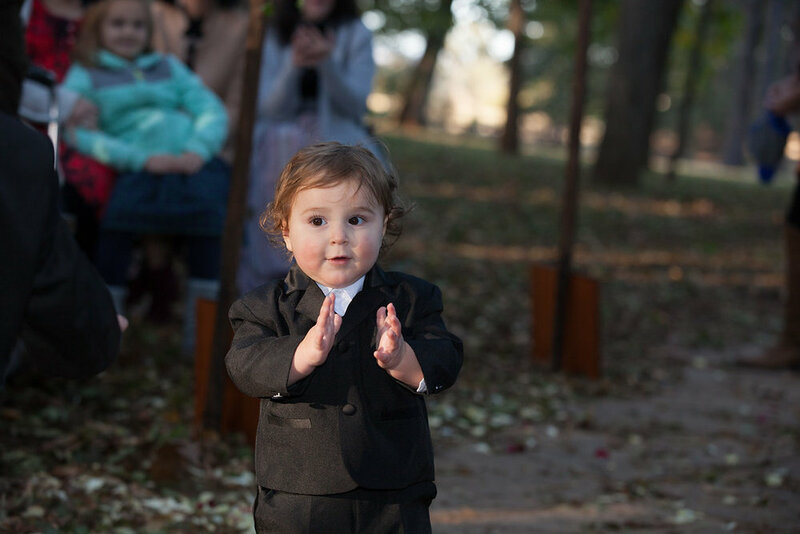 Y'all, this precious little guy walking down the aisle is melting our hearts! We could eat him up!!! Have you ever seen a happier groom?! We love that smile. Brooke and Jeffrey's reception was as fun as it was gorgeous! "The dinner tables had cream color tablecloths, and pink sequin runners added the right amount of glitz and glamour," Brooke said. "Lace fabric laid on top of the runners for an elegant vibe. Subtle greenery and flowers flowed along the tables and I wanted tall centerpieces full of flowers." 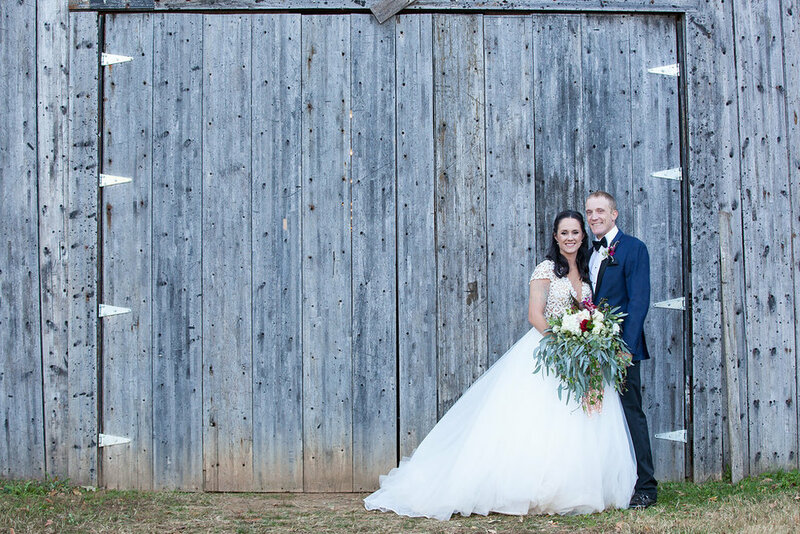 "My favorite thing about getting married at The Barn was the consideration that I was shown from everyone who worked to make my wedding happen- food, flowers, cake, decorations, setting everything up, taking everything down," she said. Brooke and Jeffrey left straight from The Barn, headed to the airport, and went off to Nassau, The Bahamas for a weeklong honeymoon! Brooke said all she wanted to do on her wedding day was "show up and show out" (we love her honesty! ), and she said her all-inclusive wedding collection made that possible. "I enjoyed time with friends and family," she said. "Lesleigh and her team provided me with the best support system possible. The day of my wedding I arrived and felt the calmest I had in weeks."